The future of reproductive health fits in the palm of your hand. Northwestern University reproductive biologist Teresa Woodruff coined the phrase “oncofertility” over ten years ago helping young cancer patients preserve their ability to become biological parents. Her work was hampered by the lack of good models of the female reproductive system for studying and testing response to drugs, so Woodruff created one herself. Five years later, she succeeded: on March 28, the team announced the birth of Evatar, a miniature scale female reproductive tract made of human and mouse tissues. It secretes a 28-day cycle of hormones, and fits in the palm of your hand. 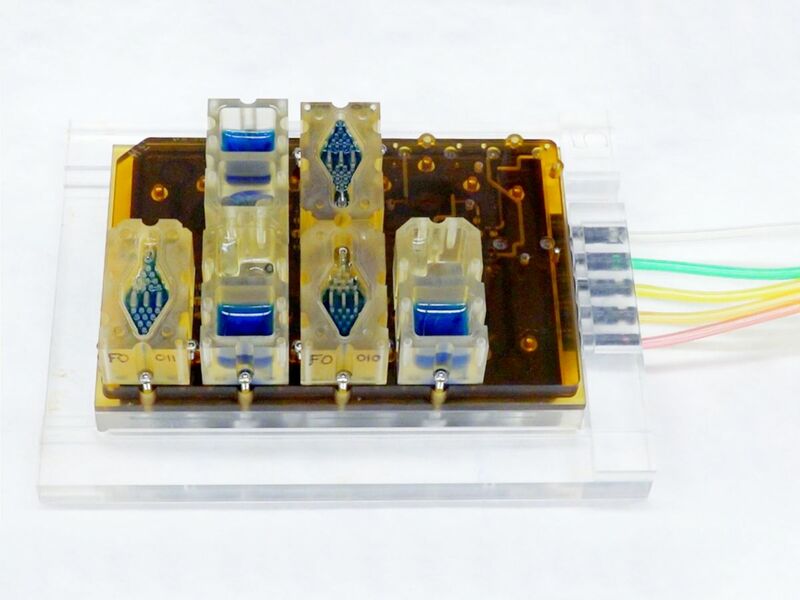 This biochip doesn’t resemble the illustrations of curvy fallopian tubes and pink tissue you’ve seen; instead, diamond- and cube-shaped plastic wells hold the blue liquid of the system. The little clear wells also hold mini-organs: a mini-ovary, a mini-fallopian tube, a mini-uterus, a mini-cervix, and a mini-liver, in that order. The wells are all screwed onto a plate which is connected to the computer that controls the flow of the liquid between the organs. The team was able to use an “off-the-shelf” liver, but the other mini-organs were designed for the system. The ovaries were made from mouse tissue, and the other mini-organs were created from donated human tissues. Team members can take samples to measure hormones such as progesterone and estrogen as they flow through the system. The device is unique because it allows the researchers to monitor and model the profile of the entire reproductive system at once. The team spent two years working with the tissues and coaxing them to grow before introducing them into the microfluidics system. Evatar, like other organs-on-a-chip systems, has the potential to revolutionize drug screening. This is why the U.S. government has invested over $100 million in the technology over past five years. However, this is the first system to model a menstrual and female reproductive cycle. This is key, because there are numerous existing knowledge gaps where the uterus is concerned. Obviously, there are ethical issues that prevent pregnant women from participating in studies of new drugs, and pharmaceutical companies have historically been lax in testing new drugs in animals, cells, and people of both sexes. In fact, this is a problem that has been widely recognized yet mostly unaddressed for decades. For these reasons, scientists still don’t know a great deal about how women’s endocrine systems (and bodies as a whole) interact with drugs. This dearth of information explains in part why good treatments for diseases like cervical, ovarian, and uterine cancers, as well as fibroids and endometriosis—which together affect as much as 15 percent of American women—are still lacking.